“Allison and her painting, as well as her self-confidence, have blossomed during her 8 years with Artworks." In our Foundations Program students learn fundamental skills of both drawing and painting. Each student is guided through a program that is entirely customized to him or her, choosing images that interest them most, from projects geared to their individual skill level. Regardless of level, each project offers the student greater knowledge of the medium and the chance to further develop his or her skills. Students progress at their own pace, moving on from simpler linear subject matter to more complex three-dimensional subject matter as their skills develop, and as teachers feel they are ready. Over time students explore a broad range of traditional mediums and subject matter ultimately including landscape, animals, and still life. 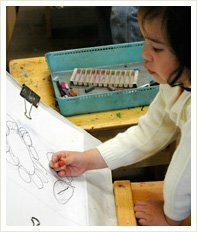 All students begin in Drawing where teachers guide them through a customized introduction to drawing techniques and materials. Students learn the basics of our drawing method and how to use light and shadow to represent form. The duration of this introduction varies from student to student as it is determined by teachers’ observation of individual student interest, capability, and progress. Students will continue to revisit Drawing curriculum throughout their enrollment, so they can explore concepts in greater depth as their understanding improves, and learn new techniques as image choice becomes more sophisticated. Over the course of the entire program, students will have an opportunity to work in graphite, chalk and oil pastel, colored pencil, charcoal, pen and ink, and other traditional drawing media. 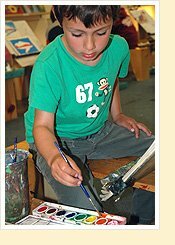 Once students develop some proficiency in drawing for their age and skill level, they move on to an introductory study of painting. 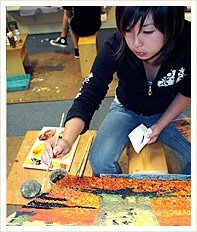 Courses in Watercolor, Acrylic and Oil paint make-up our painting curriculum. We begin each medium with exercises that offer students a chance to explore mixing and matching color, and working with the medium. As in Drawing, students progress from simpler linear subject matter to more complex three-dimensional subject matter, and will return to painting media throughout their course of study at increasingly sophisticated levels, as teachers feel they are ready. Students will learn about use and care of materials, as well as terminology specific to each medium and painting process along the way. Throughout the painting courses, we offer the widest range of technical experience while considering each student’s abilities and supporting his or her interests. Ultimately students gain a solid working knowledge of each medium and an understanding of its breadth. After having completed their Foundations course work in each medium, students will have acquired general technical proficiency, competence in color mixing and the ability to draw and paint realistically. At this point the program is further customized. Given the significant development of their abilities by this time, most students will benefit from more advanced course work in the media they’ve previously explored. Some may be interested in subjects such as portraiture or figure drawing. Others may find the study of the work of a particular artist appealing. Students with high technical proficiency may choose to explore new media. Projects at this level are highly varied. Each is designed to offer new challenges and to further the individual student’s artistic development. If you need to develop a professional portfolio, we can help. Our teachers will work with students to assess individual portfolio requirements, and offer projects customized to meet those requirements. We have extensive experience working with students on portfolios for high school applications, particularly for School of the Arts; and are equally able to provide support for college level work. Give us a call to discuss your needs. And, consider enrolling in a class for help with your portfolio. You’ll be amazed by what you can accomplish! ©2007 ArtWorks Fine Art Studio. All rights reserved.